Generator Copenhagen kohteessa Kööpenhamina, Tanska: Varaa nyt! 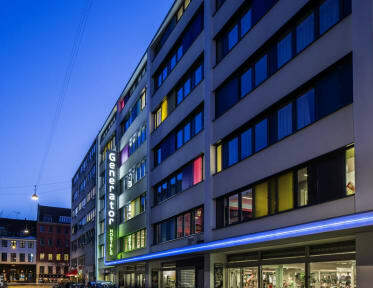 Kääntäjä: Generator Hostel Copenhagen on erinomaisella paikalla tutustua kaupunkiin jalka. Tämä hostelli tarjoaa suuria, kiinteitä alle-vuode kaapit ja yksityisyyden näytöt punkkaa ja kaikki niiden huoneissa on kylpyhuone. Usein kehui henkilökunta ovat ystävällisiä ja avuliaita, ja ovat "innokkaita antamaan hyviä neuvoja siitä, minne mennä, mitä syödä, metro kertaa, jne", mukaan Hostelworld vieraita, jotka kertovat meille heidän puhdastilat ovat verrattavissa "majoittuessa hotellissa huone hostellissa ilmapiiri ". Centrally located and an ideal location for anyone wanting to be a hop, skip and a jump from everything that is a must see in this great city. The best way to see and do it all is by foot, and when you need to rest your tired feet Generator is the perfect place of refuge, with great beds for sleepy heads, a bar and lounge that serves the best drinks and entertainment for miles around, and of course you’ll be enjoying Copenhagen life in the most stylish and authentic surroundings . 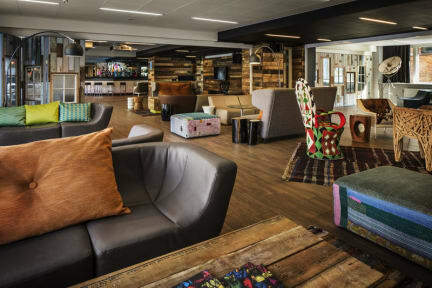 Choose from a great selection of rooms, from Dorms, to Private en-suites Twins, Double & Quads with innovative mod cons like individual power points and your own LED light for late night reading. Fast and free Wi-Fi is all yours too. To get the most out of your stay visit the travel shop and our city experts will help you devise an itinerary that will take you to all the hidden treasures this dynamic city has to offer. Very clean, good location, amazing staff. One of the best hostels I've ever been, only negative side is that there's no kitchen, otherwise was a great experience! The staff was friendly and helped out with my bag issues as well as sorting out a different room for me. The hostel is a five-minute walk to a great part of town and the harbor. Many places to eat and drink in less than a five-minute walk from the hostel. The shower is private and so is the toilette and they were very clean. The beds and my six bed set up was very comfortable. The lockers provided by the hostel are heavy duty and very large which fit both of my 50L bags.